Our generation has been improving little by little in terms of technology and even in vehicles. A lot of promos and offers about acquiring vehicles are extended from place to place and they even reached the social media sites for promotion. There are countless of riders present in our society now-a-days so this really is one of the most common and obvious development of our society. Nevertheless, what if these people experience problems with their wheels or motorcycles? What can they possibly do about it? They can either bring it to a mechanic or fix it themselves. In order to do that, one must know how to repair motorcycle and small engine with the proper maintenance of these vehicles. 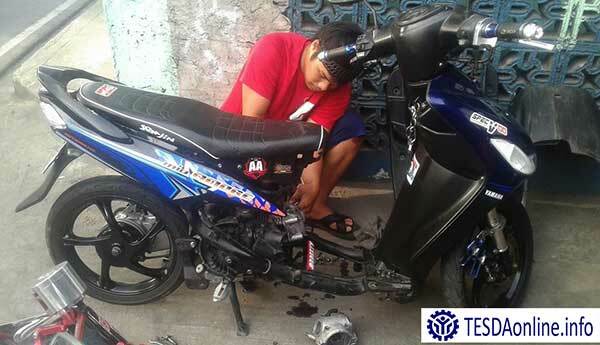 We introduce you: Motorcycle / Small Engine Servicing NC II, a short course offered by TESDA in the Philippines which will train you in the installation and servicing parts of motorcycle / small engine. Once you enrolled in this course, you may acquire variety of skills regarding the servicing of vehicles. Motorcycle/Small Engine Servicing NC II only takes a minimum of 278 hours to accomplish. Individuals who enrolled in the Motorcycle/Small Engine Servicing NC II may be required to undergo a Competency Assessment before graduation. This is applicable to any of the courses you would enroll at. A National Certificate will be issued to those who will pass this assessment. For accurate and more detailed information about the Assessment and Certification, you may visit the official website of TESDA or we suggest that you consult the people in charge with the said matter, for confirmation. Saan po pwede mag enrol ng short mechanic course on motorcycle/small engine near Antipolo or Marikina? May motorcycle course ba kau antipolo area? aside from don bosco what are your other training schools for small engine in cebu?